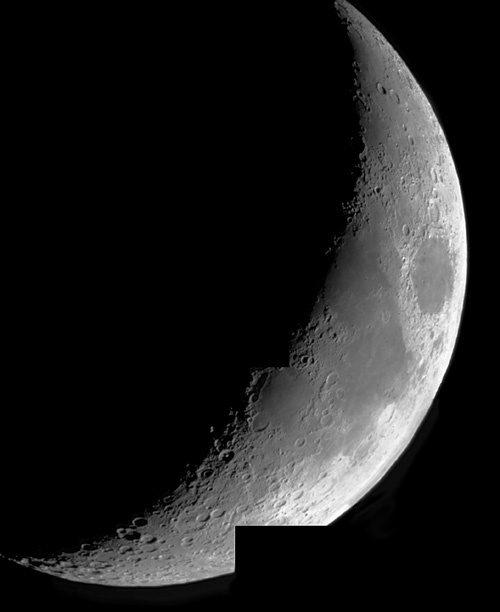 I tried making a mosaic of the whole of the crescent Moon during a howling gale. I missed one tiny part of the terminator and a good chunk of the limb of the Moon but, considering the conditions, it isn't too bad. Click here for a larger version of the image above. If you hold down the left mouse button, you can move around the image but don't push the zoom button too far along or the image will just get pixilated. You will have to click the BACK button on your browser to get back to this page.